disney’s oceania | Cinema, etc. I was looking at the videos uploaded onto the Disney YouTube channel and I was surprised at how much content was on there for their latest film Moana. So, I decided to see how much of the story could be pieced together and found there was essentially quite a bit of the first half of the film freely available. Needless to say, this is full of spoilers. The purpose is to help provide some joy to those of us who’ve seen the film but can’t wait until the home video release later this year to enjoy the various elements. It is truly a wonderful film and you can read my original review here, along with a fact sheet here. After you’ve read it, make sure to pre-order your copy for home viewing in all its glory here! In a prologue, we learn about the mystical pounamu stone, which is the heart of goddess Te Fiti. Demigod Maui steals the stone to give as a gift to humanity, but as he escapes with the stone he is attacked by Te Kā, a lava demon, in the process losing the pounamu heartstone along with a fishhook that grants him magical powers. 1000 years later, our story begins with a small Polynesian island called Motunui. Here we find Moana Waialiki, a small child who is the daughter of Chief Tui and therefore set to become leader of the island tribe. As a baby, she appears to have a mystical connection with the sea. A montage of Moana growing up occurs throughout the song “Where You Are” (video includes audio only). Her affinity to the sea is reinforced throughout the song, along with the importance of the natural crops and resources the island provides. The islanders are growing in concern for their crops and fish, which are unexpectedly dying. Unbeknown to them, the cause of this is the missing pounamu heartstone. Moana wishes to leave the island to find more fish, but her father wants her to stay on the island. She makes a first attempt at leaving the island via the song “How Far I’ll Go”, along with her trusty pet Pua the pig. Moana has a chat with Gramma Tala to help decide what to do. We are further introduced to the ways of Moana’s island via the song “We Know The Way”, which is a celebration of voyaging as the pride the fishermen find in their navigation and fishing skills. This is a musical interpretation of what Moana reads on the inside of a cave in ancient wall paintings. Gramma Tala reveals that she has had the heartstone and gives it to Moana. She also reveals a hidden cave of boats from the island’s past life as voyagers. Sadly, Gramma Tala dies, and with her final breath tells Moana to set sail. She does this, but unbeknownst to her she does this with incompetent chicken Heihei as her only companion. The “How Far I’ll Go” reprise plays. Moana encounters a terrible storm, which throws her from her boat and leaves her unconscious. When she wakes, she discovers she is on a deserted island, though one other inhabitant is there: the demigod Maui. Maui introduces himself, wowing Moana as he sings “You’re Welcome”. This is also a cunning ploy to steal her boat to escape the island, though he leaves her on the island alone and trapped inside a cave. Moana breaks free from the cave and attempts to swim after Maui. The ocean helps reunite the pair. They resolve their differences and Moana convinces Maui that to be a true hero he must return the pounamu heartstone to its rightful place to restore harmony to the sea, agreeing also to help him retrieve his magical fishhook on the way. Shortly after, they encounter the coconut pirates Kakamora, who wish to steal the heartstone. They then visit the giant crab Taratoa, who has a cave of jewels and gold that he uses to attract fish to his cave to eat them. He is in possession of Maui’s fishhook. Maui and Moana work together to steal back the fishhook and they set sail again. Shortly after, Maui teaches Moana about “wayfinding” as he realises that she has never sailed before. They set sail to return the heart to Te Fiti, but when they arrive they are attacked by the fire demon Te Kā, who damages Maui’s fishhook in the process and also repels them in their boat far out to the ocean. Maui leaves for fear of yet more damage to his hook, which will result in him losing his magical powers. Moana returns to Te Kā alone, and as she does this Maui returns, having had a change of heart. This time Moana asks the ocean to help clear a path between her and Te Kā, and she sings “I Am Moana” to remind the goddess of who she really is, thus allowing her to restore her heart. With Te Fiti restored, she thanks Moana with a new boat and a replacement fishhook for Maui. Moana says farewell to Maui and returns to her island, which begins to thrive under the new conditions. Disney have since published some additional scenes, destined for the Blu-ray (due out in March 2017). Walt Disney Animation Studios have released their 56th animated film, the musical Moana. I’m going to whisper this quietly, but it might actually be better than Frozen. The story follows 16-year-old girl Moana (Auli’i Cravalho) as she defies her passage to become the leader of the tribe on the fictional island Motunui. 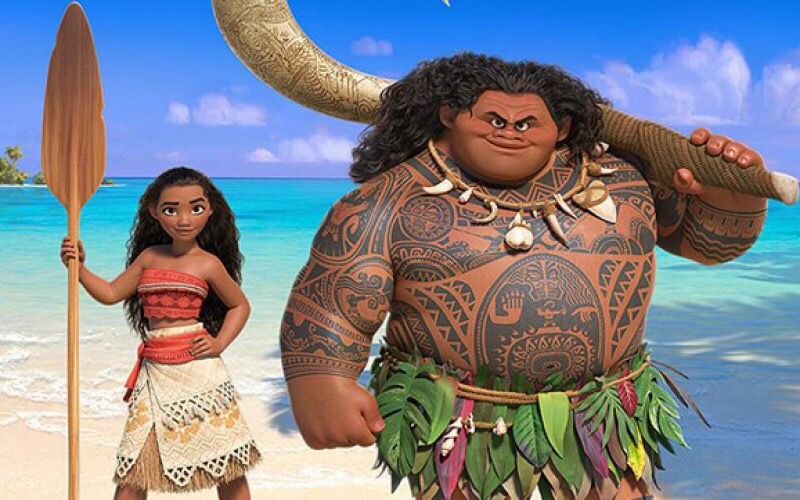 Her father Chief Tui (Temuera Morrison), leader of her island tribe, and her mother Sina (Nicole Scherzinger), are fearful of the water and want her to remain on the island, but her outgoing grandma Tala (Rachel House) encourages her to leave and hunt down the demigod Maui (Dwayne Johnson) to solve a mysterious curse that she believes has led to a poor harvest. The basics of the story are, on the face of it, quite by-the-numbers. There’s a teenage protagonist, which makes it relatable for the younger viewers. She goes on a quest that has a practical purpose but also helps her develop as a person. She teams up with an unlikely buddy to help her in her journey. We’ve seen it many times before but the familiarity doesn’t hamper its success. Where the story excels is threefold. Firstly, it has a brilliantly sharp and humorous script, which the actors are clearly having a lot of fun with. Secondly, the animation of both the characters and the surroundings is absolutely stunning. Finally, the music, which was written by Hamilton’s Lin-Manuel Miranda, Mark Mancina and Opetaia Foa’i, is outrageously good, and goes much further than simply one great flagship song (in this case “How Far I’ll Go”, sung by the lead and effectively Moana’s answer to “Let It Go”). Indeed, it is unfortunate that the film has been unleashed in the same year as La La Land, which is destined to sweep up at most of the award ceremonies, at least in the Best Song categories. Miranda may have to have another attempt in a less competitive year. There are a couple of nice smaller roles that are grasped by those involved. Alan Tudyk may be more famed for his turn as K-2SO in Rogue One this year, but he’s equally hilarious as Hei Hei the Rooster here, constantly stealing scenes with sound effects that match the ridiculousness of the island’s most endearingly stupid bird. Elsewhere, Jermaine Clement shows up as Tamatoa, a giant kleptomaniacal crab who has a penchant for all things shiny. But the plaudits must go to Auli’i Cravalho, who comes in as a complete unknown and has delivered a lead performance that equals the best Disney has ever achieved. At just sixteen but with a voice as good as anything I’ve ever heard on stage, she has a very bright future indeed. Moana is a must see this holiday season and should be top of your list if you need to entertain any younger relatives over the coming weeks.